If you’ve been coming around Smells Like Home for long enough, you’ll know that we love coffee. These café mocha cupcakes exemplify this love in a die-hard coffee lover kind of way as do the more subtle banana espresso chocolate chip muffins and the over the top toffee bar brownie torte. I’ve become such an addict (pun intended) of what espresso powder, instant coffee, and strongly-brewed coffee does to the flavor of chocolate that I can now almost never turn away from a recipe that contains one of these formidable combinations. 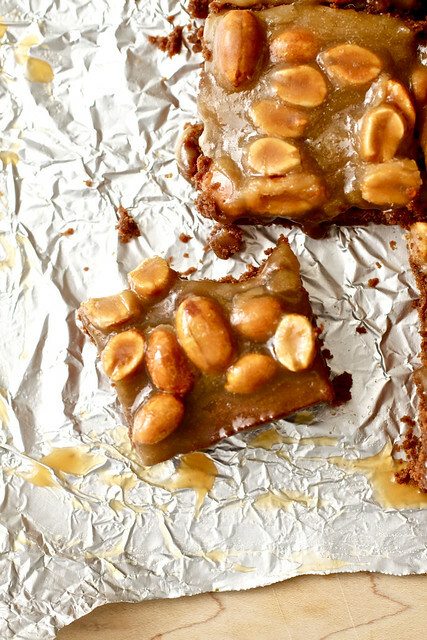 Enter today’s Project Pastry Queen recipe: Turbo-Charged Brownies with Salted Caramel Peanut Topping. I couldn’t stop thinking about these brownies for the 2 weeks between announcing my choice and making them yesterday. They were the kind of pervasive thoughts that made their way into my conscious mind on multiple occasions while at my desk working on my manuscript. They peaked around corners reminding me to lay off the sweets and go for the fruit during the week. They are what got me out of bed yesterday morning at 6:30 to start baking because I just couldn’t hold off any longer. And oh.my.gah were these brownies worth every second I waited. A jolt of rich chocolate brownie from beneath a salty caramel and crunchy peanut-studded layer wakes up the taste buds and has you reaching for either a glass of ice cold milk or a steaming cup of, yes, coffee. My experience with these brownies left relatively nothing to be wary of. 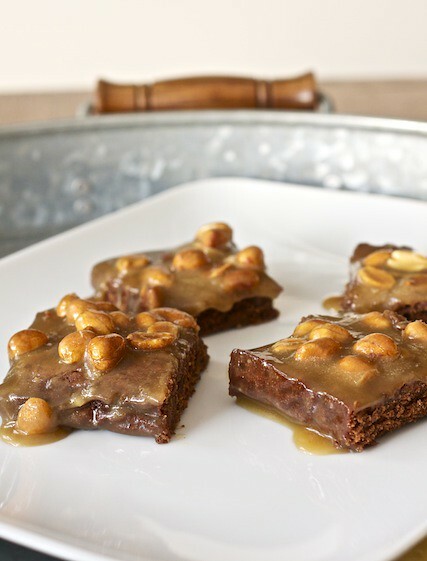 A basic brownie recipe, baked thin, then covered in a quick caramel and peanut mixture is simple and straightforward. The recipe states to bake for 30-35 minutes (leaving the center slightly gooey) but I found that my brownies were completely baked after 25 minutes – next time, I’ll start checking them at 20 minutes and I’ve made this adjustment to the recipe below. The only other changes I made were to add 1/4 tsp coarse sea salt to the caramel, swap out the pecans from the original recipe for honey roasted peanuts, which also lent a little extra salt to the caramel, and to reduce the granulated and brown sugar in the brownie recipe by 1/4 cup each – the topping adds more than enough sweetness to this dessert and I didn’t miss that 1/2 cup sugar in the brownie at all. As rich as you can expect these brownies to be (and they are that rich), consider cutting them into smaller pieces – a 13″ x 9″ pan yields 24 decently portioned brownies that will leave you quite satisfied. And happy. Very, very happy. These decadent brownies won’t last long on any dessert table. Be aware that the topping will start to look less like caramel the longer they remain at room temperature so serve them relatively soon after baking them. Consider serving with some vanilla bean ice cream or using the topping recipe itself drizzled on top of a scoop of ice cream. Preheat the oven to 350 degrees F. Line a 9″x13″ baking pan with aluminum foil, leaving several inches hanging over the short ends of the pan. Grease the foil with butter or cooking spray. In a large metal bowl set over a pot of simmering water, melt the butter and chocolate and stir until the chocolate and butter have completely melted. Alternatively, you can melt the butter and chocolate in the microwave in a microwave-safe bowl on medium-high for 30 second intervals, stirring after each interval, until the chocolate and butter have melted together. Stir in both sugars. Add the eggs and vanilla all at once and stir until the batter is smooth and shiny. In a small bowl, combine the espresso powder and the boiling water; stir into the brownie mixture. Stir in the flour and salt – do not overmix. Pour the batter into the prepared pan, smoothing it evenly. Bake 20-30 minutes, until the brownies have just begun to shrink away from the sides of the pan. Do not overbake; the brownies should be slightly wet inside. Cool completely, about 1 hour at room temperature or 15 minutes in the freezer. Leave the oven at 350 degrees F.
Arrange pecans on a baking sheet in a single layer and toast for 7 to 9 minutes, until golden brown and aromatic. Break the nuts into large pieces. If you’re using peanuts, you can skip this step. In a 2 1/2 quart saucepan, combine the cream, brown sugar, butter, and corn syrup and stir over medium-low heat until the mixture is smooth and the butter has melted. Bring to a slow boil; boil without stirring, about 6 minutes. (If the mixture starts to boil over, you’ve set the heat too high. Turn down the heat a notch.) Remove the mixture from the heat and let cool, about 5 minutes. Stir in the vanilla and pecans or peanuts. Pour the topping over the cooled brownies, spreading it with a knife or spatula to cover evenly. Let the topping cool at least 15 minutes at room temperature. Lift the brownies, still in the foil, out of the pan. Cut them into small 2-inch squares – these babies are rich. Yields: 24 brownies. Tara, these look AMAZING!!! Seriously, I might need to unsubscribe from your blog until I’m allowed to eat dairy again. You’re killing me! These look amazing. I can’t wait to make them! those brownies looking great. Perfect with some coffee! Everything is better with salted caramel. These look messy in such a good way. Oh my lordy!! These look to die for!! Great recipe choice! I loved the espresso-chocolate combo with the sweet & salty topping. Ginger licking good. Love that sweet and salty combo. Oh man, I love salted nut brittle. Adding that to a brownies sounds and looks delicious. I want dig right into that drippy sauce. These look sticky and delicious! What a great combination here! What a delicious combination of flavours! The perfect dessert with a nice strong cup of coffee…or iced coffee, right now! Thanks! What a treat! 🙂 Yum! It should be illegal to post things like this! I’m sitting in a puddle of drool at the moment just looking at them! 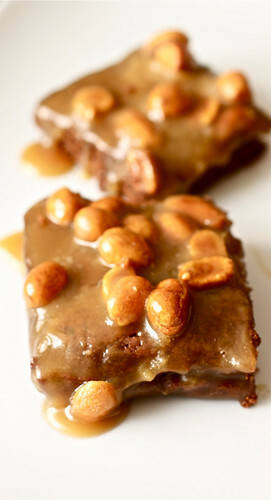 Must make some right now to satisfy intense caramel and peanut cravings!